An estimated 22 million Americans suffer from sleep apnea. Are you one of them? The sleep disorder does more than render a good night’s sleep virtually impossible. It can also lead to heart problems, high blood pressure, liver issues and more. And, it’s only one of the sleep conditions that could leave you exhausted in the morning. Snoring is the other. Around 40% of adult males and 24% of adult women snore habitually. Whether you suffer from sleep apnea or snoring, it’s important to do everything you can to control your symptoms and reverse the condition. Though there are machines to purchase and lifestyle changes to make, you can take one of the most important steps today. Simply change your pillow. That’s right: Buying a pillow for sleep apnea or snoring sounds like a simple move, but it could make all the difference in how well you (and those around you) snooze. Today, we’re discussing what makes a pillow like this so special, and why you need one in your life today. Before we discuss the benefits of a sleep apnea pillow, let’s review what comprises the sleep disorder. Sleep apnea is a sleep disorder. It occurs when someone’s breathing stops and starts during sleep. In fact, the term is Greek for “no breath.” Those who don’t suffer from the condition breathe continually even while their body is at rest. Conversely, sleep apnea sufferers go for up to several minutes at a time without breathing, depriving their body of valuable oxygen and dangerously raising carbon dioxide. As those levels become imbalanced, it signals to the brain that irregular breathing is occurring. In response, the person is startled awake as a cortisol hormone is released. Over the long term, this sudden stress response can wreak havoc on the sufferer’s heart rate and blood pressure. It can also cause a range of other medical conditions, ranging from insulin resistance to nonalcoholic fatty liver disease. There are three forms of sleep apnea including obstructive, central and complex. Let’s review the characteristics of each. This is the most common type of sleep apnea. It occurs when someone’s throat muscles periodically relax while they’re sleeping. When this happens, air is blocked from flowing into or out of that person’s mouth or nose, although they are actively trying to breathe. In the case of central sleep apnea, the person’s throat muscles and upper airway tissues are in working condition. However, their brain fails to send signals to the muscles that control their breathing. In other words, it isn’t that the person can’t breathe. Rather, they are not trying to breathe. This syndrome is also referred to as treatment-emergent central sleep apnea. It occurs when people suffer multiple episodes of central sleep apnea (more than five an hour), or when central sleep apnea symptoms emerge after someone with obstructive sleep apnea uses a continuous positive airway pressure (CPAP) device to regulate breathing. When you breathe at night, the airflow makes the tissues in and around the back of your throat vibrate. Sometimes, this can create the loud, rumbling sound that we’ve come to associate with snoring. The condition is exacerbated when your throat muscles relax due to alcohol consumption, when your sinuses are congested or when you’re lying on your back. Snoring can occur whether you’re a nose breather, mouth breather or a combination of the two. Though it is sometimes a symptom of obstructive sleep apnea, snoring is a different medical issue in and of itself. Not everyone who snores has sleep apnea and vice versa. Snorers are at a heightened risk of developing a stroke, heart disease, irregular heartbeat, and more health concerns. You could toss and turn all night. You could invest hundreds to thousands in pricey sleep machines, as well as mouthguards, noseguards, and straps. The reality is, there are myriad anti-snore products on the market. Or, you could find an anti snoring pillow that can help you get a great night’s sleep, whether you suffer from snoring, sleep apnea or both. That’s where the Smart Nora comes in. This innovative new pillow actually isn’t a pillow at all. Rather, it is a self-adjustable, air-inflated insert that you can slip inside your pillow of choice. It is digitally synced to a sleek wireless device that can sit by your bed or be attached to your headboard. What does this mean for that favorite pillow or pillowcase of yours that you take everywhere? You don’t have to sacrifice comfort for function. You can still use it! Moreover, the wireless device is simple and minimalist enough to complement any style of bedroom decor. It looks like another cool smart accessory by your lamp and stack of books to read. Wondering how this anti snore pillow works? Let’s delve in. To use the Smart Nora, you’ll simply slip the insert into your pillowcase, below your pillow. Then, you’ll tap the wireless device to signal it’s time to start and head to bed. While you sleep, the Smart Nora device listens carefully. It’s picking up on the earliest signs of snoring that are barely audible or noticeable. This early detection often occurs before your partner even realizes you’re in the process of snoring. As soon as your throat muscles begin to relax and your head moves slightly in response, the device is signaled to motion. It begins to gently move the inflated insert by inflating and deflating it. This motion serves to stimulate your throat muscles, triggering the continuation of normal breathing. Are you worried that the automated motion in your Smart Nora pillow will keep you up at night? You don’t have to be. Its manufacturers explain that while you might notice the movement for the first few nights, after three to five days, you’ll grow accustomed to it and won’t even realize it’s occurring. Keep in mind that even the best pillow for sleep apnea can be rendered useless if you’re forced to lie in an uncomfortable or unnatural position the entire night. Though some anti snore pillows claim to help curb the condition, you may still wake up sore and tired from trying to fall asleep in an awkward posture or arrangement. Many can also be lumpy, hard or heavy to move. In addition, other snoring solutions may be designed to physically move your jaw and tongue, making consistent use almost impossible. On the other hand, the Smart Nora was made with flexibility in mind. It’s equally effective whether you use it while lying on your back, your stomach or your side. This is an ideal advantage, considering that many snorers are habitual back sleepers and find it most comfortable to fall asleep that way. Yet, as anyone who has ever slept beside a snorer or sleep apnea sufferer knows, the conditions tend to get worse in this position. That’s why many snorers have taken to propping themselves up with pillows all around to prevent them from rolling over on their back. That might work in the short-term, but it’s no way to live and definitely no way to sleep. You shouldn’t have to change your natural habits because you suffer from snoring or sleep apnea. Finding a pillow that lets you get comfortable in your own unique way is essential to making sure you use it for the long term. Additionally, you can sleep on any portion of your pillow and the Smart Nora will still be equally as effective. The insert features a folding structure that extends all the way from one side to another, so the entire surface area is covered. This means whether you’re accustomed to hugging the very edge or sleeping right in the middle of the pillow, you can continue to situate your head exactly as you prefer. What if you and your partner both snore? Can two devices work side-by-side? The answer is “yes!” The device would need to be positioned in a way that your partner’s snoring didn’t activate your insert. Still, even if that occurred, the up-and-down movement would be so slight it would still be unrecognizable. Sure, a sleep apnea pillow is ideal when you’re at home. Yet, who wants to travel with a bulky system, especially if they’re always on-the-go for work or play? Thankfully, not only is the Smart Nora system ultra-sleek and lightweight, but it also comes with a handy, stylish traveling bag. This makes it easy to both pack and remember. Even if you don’t feel like lugging your pillow around with you everywhere, bringing along your device means you can transform even the softest, least supportive hotel room pillows into a workable nighttime solution. As Transportation Security Authority (TSA) guidelines can be tricky to navigate when it comes to devices such as these, it’s best to not carry on your Smart Nora device. Rather, include it in your checked luggage to keep it as protected as possible. If you’re a persistent snorer or you suffer from sleep apnea, you may use myriad online tools and apps to track your sleep cycle. This software can indicate wake times and determine the percent of the time you spend snoring or not breathing. The good news? Smart Nora has a companion iOS app. It’s in its final stages of development and is set to be released in the Apple Store soon. In the meantime, some have synced it to other apps to monitor their progress, though the device works independently of any mobile app. In other words, you don’t have to download anything on your phone to reap all of its rewards. Before making any major purchase, it’s helpful to consult with friends, family members, co-workers, and even others on the internet to get their feedback and opinions. Research shows that 88% of people trust online reviews prepared by other consumers. In this sense, word-of-mouth marketing is far from gone and is, in fact, one of our chief purchasing motivators. To this end, it’s helpful to review what others are saying about the Smart Nora before investing the money in one yourself. This is where the product truly shines. More than 600 people gave five out of five stars on the manufacturer’s online review portal. Seventy-one people gave it four out of five stars and 25 people gave it three out of three stars. The takeaway? Positive reviews are flooding in and that many people saying the same thing can’t be wrong. Before researching more about Smart Nora, those who suffer from sleep apnea should understand that this pillow is only intended to reduce snoring. As aforementioned, snoring could signal obstructive sleep apnea, or you may have sleep apnea without heavy, persistent snoring. Either way, the pillow is not a replacement for any therapy, treatment or device that your doctor might have prescribed you based on your individual condition. Living with snoring or sleep apnea can affect your entire life, as well as the lives of anyone within earshot of your bed. Chances are, your doctor already has you on a path toward treating and managing your sleep disorder. While you’re following those programs and taking that advice, it only makes sense to add a specialty pillow for sleep apnea to your regimen. 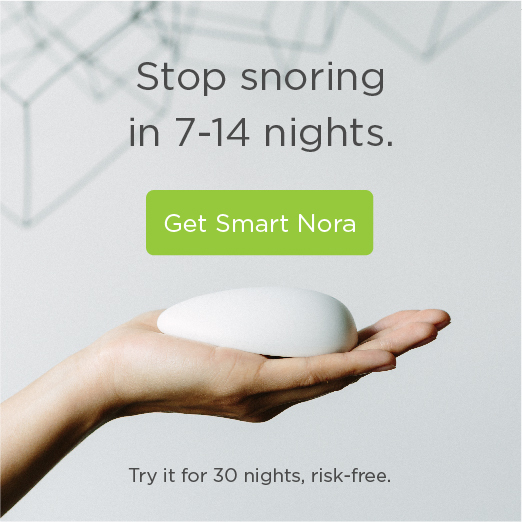 Smart Nora gets it and can help you reclaim the quality of sleep that you’ve been missing. Interested in learning more about snoring and sleep apnea? Curious as to which products live up to their hype and can help you tackle the condition from home? We can help. We’ve done the research and written the feedback, allowing us to speak authoritatively on this topic. Feel free to check out our product reviews to see the pros and cons of all the items. Then, contact us with any questions and let us help you sleep better tonight. As always, we hope you have found this article both enjoyable and informative. If you have, could we please ask you to share it with friends and family through your social media platforms. It really helps us and is greatly appreciated! Perhaps you've already tried traditional "stop snoring" strategies like switching up your sleeping position or trying to change the way you eat before bed. If so the Smart Nora maybe the solution you are looking for.